Dr. Katharine M Ammons, MD is a Doctor primarily located in Rome, GA. She has 27 years of experience. Her specialties include Internal Medicine. She speaks English. Dr. Ammons has received 5 awards. The overall average patient rating of Dr. Katharine M Ammons is Great. Dr. Katharine M Ammons has been rated by 18 patients. From those 18 patients 6 of those left a comment along with their rating. The overall rating for Dr. Katharine M Ammons is 4.2 of 5.0 stars. Every time I have ever gone to Dr. Ammons, she has just referred me to other doctors. She never treated me herself. Whether it was just an earache, upset stomach or any other minor thing. She is just basically a referral doctor. It's common to wait in her office for two hours or more, and she and the staff act like they are doing you a favor by letting you see her at all. Some of the people that work for her are rude and disrespectful, and she herself can be a mean, hateful bully with an explosive temper. I tried to overlook these patterns for a long time, but finally had to change doctors. Very Professional in every way and her skill speaks volumes. You may wait awhile to see her but this is because she takes the time and listens to her patients! Worth the wait to see her. She is thorough and knowledgable. She spent enough time to really understand my problem and when she had to say hard things to hear, she did so with compassion. She made me want to be a good patient and follow her instructions...and that is amazing. I have recommended her to others. They won't be disappointed. She is truly a God-send. 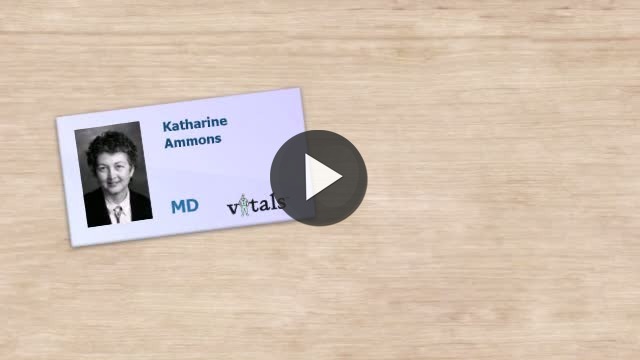 Take a minute to learn about Dr. Katharine M Ammons, MD - Internal Medicine in Rome, GA, in this video. Dr. Katharine M Ammons is similar to the following 4 Doctors near Rome, GA.
Have you had a recent visit with Dr. Katharine M Ammons? Select a star to let us know how it was.